Last night Kerry Washington took to Twitter to let the world know that this episode of Scandal was written by a black lady (Raamla Mohamed), and directed by another black lady (Debbie Allen). It’s a great answer to the ongoing questions about diversity on screen and offscreen in media and entertainment. Where are all the black ladies? Well, last night, some of them were handling another strong episode of Shonda Rhimes’s show. If you enjoyed last week’s “Run” as much as I did, you may have gone into this episode feeling a little apprehensive. Would the momentum keep up, or would we be disappointed after such a wonderfully strange winter premiere? For the first 20 minutes or so, as we re-entered the White House and the offices of Olivia Pope & Associates, I’ll admit that I missed the darkness and mystery of “Run.” It was a necessary opening though, as it confirmed what many viewers suspected—that the Vice President Andrew Nichols (along with RNC head Elizabeth North) was responsible for Olivia’s kidnapping. Fitz is basically told to play nice, and not reveal any of this to anyone—and we watch as he grows increasingly paranoid. He really can’t trust anyone, and he can’t even speak freely to the few people he does still trust. As a result, he has to pretend to whisper sweet nothings in Mellie’s ear, as he tells her, “In 24 hours, I’m going to kill Olivia Pope.” He means, of course, that he doesn’t think he should go to war to save her. But Mellie knows Fitz, and she knows she, essentially, needs to give him permission to declare war on West Angola, so that he can have the love of his life back. These kinds of scenes are the ones we used to love seeing on Scandal. Mellie is such an odd, incredible First Lady and wife. Even if her intentions are sometimes selfish, she always wants what’s best for Fitz—whatever is going to make him function at his highest level. That Olivia Pope, his lover, is one of those things rarely matters to Mellie. So she does the right thing, and urges Fitz to do whatever it takes to get Olivia back. And when Elizabeth comes to her after being tortured by Huck, Mellie takes her involvement a step further. But first, let’s discuss the return of HUCK. Scandal is a show that plays on your perceptions of good and evil, and everyone loves how Guillermo Diaz plays this character—he can be so bad, and because we love him, it’s always so good! So I confess that it gave me great pleasure to see him sitting in Elizabeth’s daughter’s bed, whispering over her, and threatening to kill her. Huck loves Liv! You don’t screw with Liv! Now, I’m glad he didn’t hurt the daughter, and I was sick looking at Elizabeth’s back, but… well, it worked. At least, it sort of worked. Mellie puts that good-good (yes, that’s the technical term) on the VP, and steals his burner phones while he’s knocked out. Elizabeth passes these on to the Gladiators, and asks Huck to kindly stop torturing and terrifying her. 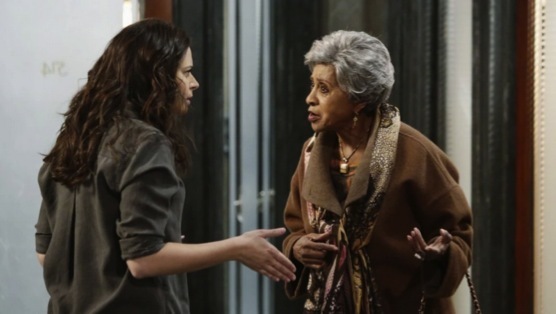 With the help of Lois’ friend (I love that two elderly ladies and Life Alert led everyone to the apartment across from Olivia’s), the Gladiators trace to Liv to… wait for it… Pennsylvania. David Rosen puts on his 10-gallon white hat and helps them with backup for the break-in at the hideout. Of course, the Great Fixer had already rescued herself, sort of. I just love that Olivia was already showered, had her hair permed, and was on a plane with Ian when Jake was busting down doors to save her. I mean, talk about redefining Helen of Troy. Liv is not going to wait 3 years or 10 years to be rescued. She treated Ian like a client, asked him what he wanted (duh—power and money) and came up with a game plan that he couldn’t refuse. Ian is now his own boss (not a babysitter), and the billion dollar auction for Olivia Pope is about to begin. This is an excellent twist because it means that Olivia is safe, but Fitz and everyone else will still have to fight for her to make it home. And something tells me Fitz will have to do unspeakable things to either win the bid for Olivia, or secure her from the gabillionaire who does. Things are going to get increasingly more interesting, but I also want the Scandal writers to somehow keep things realistic. My biggest beef with this episode had to be the whole bit where Olivia got her glass of water, while recording that proof-of-life video. Come on now. After everything she did trying to escape, I think they’d be a little more careful. Enjoying Scandal often means that we must suspend our disbelief, but I just want the coming storylines to continue to be exciting and somewhat realistic. Also, shouts-out to that old black lady who refused to refer to Olivia as anything other “the black lady.” Great stuff. And someone let Shonda Rhimes and Kerry Washington know that I make a mean beef stew, in case they’re ever in the area and looking for a good meal.